When gybing, and generally in choppy sea conditions, sudden but reurrent slackening and tightening of the main sheet can produce strong shock loads to the boom and the rest of the rigging. Furthermore, if the upper end of the sheet block and tackle is fastened to a point which is situated below the boom's (longitudinal) centre line, as when a tang or eye is fastened to the bottom of the boom, while the boom gooseneck is near the centre line in the usual way, there is also a nasty twisting force acting on the gooseneck and boom bracket assembly. 1) The top sheet block is not fastened directly to the usual boom end eye, but to another block (mounted upside down, as it were) which runs freely on a fixed bridle rope looped around the boom. In this way, the sheeting force is always directed through the centre of the boom, and there are no excentrical strains transmitted. 2) An rubber snubber is inserted in the loop bridle described above and provides additional shock damping and lessens the impact from sudden jerks in the boom. 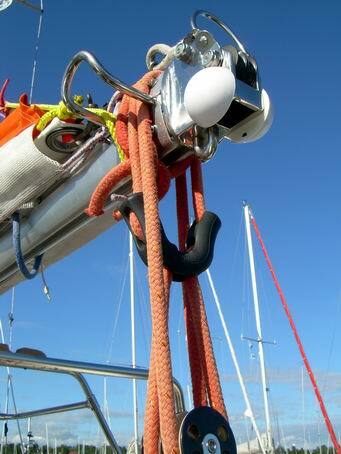 This elastic contraption is actually designed to absorb peak strecthing loads in mooring lines. De ofrånkomliga krafiga rycken i storskotet som uppkommer vid släng-gippar eller i skvalpig sjö kan orsaka skadligt stora laster i bommen och hela riggen. Om storskottaljan dessutom är infäst till en punkt på bommen som befinner sig lägre än bommens centrumlinje uppstår vid varje ryck även en stor vridande kraft på bombeslaget. 1) Storkotet är inte fäst direkt i bom-ändans normala fästpunkt utan till ett ett annat block som löper fritt på en fast ögla kring bommen. På det sättet blir alltid dragkraften centrerad genom bommens mittlinje och skadligt vridmoment kan inte uppstå. 2) En gummidämpare (egentligen avsedd för ryckdämpning i förtöjningslinor) är monterad i den beskrivna öglan och ger därmed extra elasticitet vid plötsliga hårda ryck i bommen.